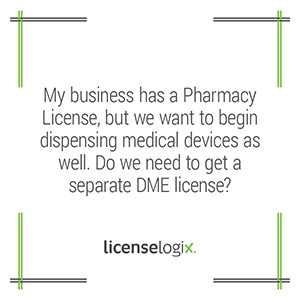 Do we need a DME license in addition to a Pharmacy License? In some states, durable medical equipment falls under the umbrella of a pharmacy license. However, in many states, a business like yours would be required to obtain a separate DME license, likely from a different licensing agency. Please contact us if you would like LicenseLogix to look into any additional licensing requirements that may affect you.